Celebrate spring with the bold colors of this striking and unique blend. Specially selected to create eye-catching displays in landscapes and large exhibit plantings, our Three Cheers for Spring Mixture delivers brilliant hues and a mix of wonderful forms to the early- and mid-spring garden. Your customers will love the fragrant Martinette daffodils that appear in plump clusters of yellow and orange blooms. 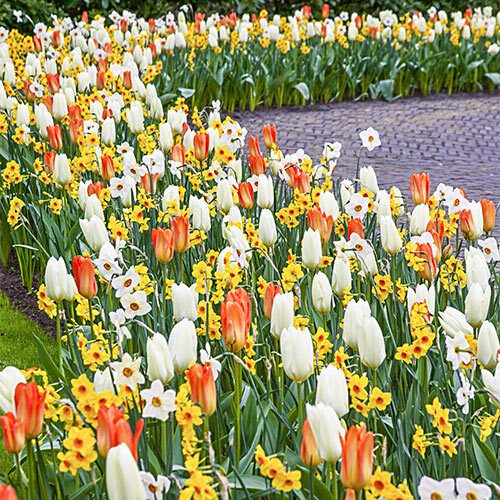 They blend nicely with the orange and white Purissima Fosteriana tulips, making quite the spectacle as they appear at the same time in beds, borders and mass plantings. Three Cheers is perfect for landscaping larger sites, too, such as focal points and naturalized areas.